Resource expansion. Drill holes CA-17-77 and -79 were drilled on section, a section that had not been previously drill tested. The drill holes are stacked vertically and show that the Callanquitas structure in this section is becoming thicker and higher grade at depth (please see drilling cross section below). On the adjacent drill section to the north, 4805, the deepest drill hole, CA-12-48, cut 1.9m grading 7.2 gpt Au and 315 gpt Ag at an elevation of 3225 metres, and is also unconstrained by drilling at depth. Coupled with the results from hole -77, it is apparent that the Callanquitas structure is open at depth and, given that there is no drilling for approximately 190 metres north along strike from section 4805, there is appreciable resource expansion potential on this portion of the Callanquitas structure. An additional drill hole has been added to the previously announced program to explore at depth below drill hole -79 on the 4805N section. Bulk minable exploration targets. The drill results for holes -77 and -79 confirm the exploration model developed by PPX geologists that thick breccia zones, with significant gold and silver grades, are present at the Igor project. These drill results will help improve targeting for other thick breccia zones at the Igor project that may be surface minable at a large scale. Grade distribution, impact on underground mining, and mineral processing alternatives. The results from drill holes -77 and -79 further confirm the gold and silver grade distribution seen in the Callanquitas structure: Highest grades are adjacent to the footwall of the structure and gradually diminish towards the hangingwall. It should be noted that the gold grades seen in these drill holes are very similar to the average grade reported for the bulk samples that have been collected as part of the Company’ test mining and bulk sampling program at Callanquitas (8.07 gpt Au, please see PPX press released dated October 16, 2017). Also, by adjusting the cut off grade of the composites, thick intervals of lower grade rock are defined, at grades that would be appropriate for potential future heap leach processing, i.e. 7.7m grading 5.37 gpt Au and 5.3 gpt Ag in drill hole -77 (please see table below). As previously announced, the Company is evaluating the use of heap leach processing for treating Callanquitas mineralization, seeking to take advantage of lower operating costs and capital requirements. 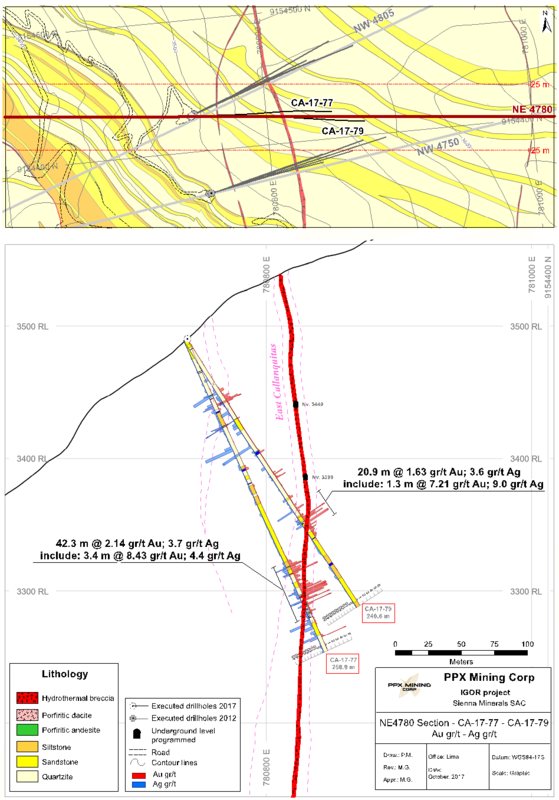 The infill and resource confirmation/expansion drilling program was designed by PPX geologists and our technical consultants, Mine Development Associates of Reno, Nevada, to confirm, upgrade and expand known gold and silver resources on the Callanquitas structure as part of the Company’s Pre Feasibility Study (“PFS”), expected in Q1 2018. Channel sampling protocols and QA/QC: PPX Mining geologists collect diamond drill hole samples from core immediately after geologic and geotechnical logging. Samples are collected based on natural breaks in geologic features and also on individual drill runs. Samples are broken at obvious geologic boundaries to correctly separate rock types, mineralization styles and hydrothermal alteration assemblages. Samples are collected by cutting the core in half using a diamond saw, preserving the second half for check analyses, further study and reference. Samples are sealed, labeled and stored in a secure area prior to shipment to a qualified assay laboratory. Gold and silver analyses are conducted by the fire assay method with a CN leach. Blanks and standards are inserted approximately every 15 samples; duplicate samples are included at the same intervals. Duplicate fire assays for approximately every 30 samples are sent to a second assay laboratory for umpire analysis. About PPX Mining Corp: PPX Mining Corp. (TSX.V: PPX.V, SSE: PPX, BVL: PPX) is a Canadian-based exploration and development company with assets in northern Peru. Igor, the Company’s 100%-owned flagship gold and silver project, is located in the prolific Northern Peru gold belt in eastern La Libertad Department. PPX is pursuing a two-prong strategy to further develop and explore the Igor Project. The Company has begun work on its underground test mining and bulk sampling program which is designed to upgrade the resource estimate and generate data to evaluate the possibility of future mine development at Igor through the PFS process. To date, PPX has processed over 4,807 tonnes of bulk sample averaging 8.07 gpt gold. Simultaneously, PPX is accelerating its exploration program at Igor in order to fully evaluate the resource potential of the entire Igor project area. The Callanquitas Structure is open along strike and at depth. Parallel structures are unexplored and, coupled with the Domo and Tesoros areas; these drill targets highlight the exploration potential at Igor. Evaluating mine development alternatives in parallel with exploration drilling provide dual catalysts for growth and increasing shareholder value.